Strange green jelly-like substances have been appearing near waterways in the RSPB nature reserve at Ham Wall. Scientists are somewhat baffled by the origins, however historical documents reference a slime that can be seen following a meteor strike. The strange grey-ish white substance tends to evaporate quite quickly. 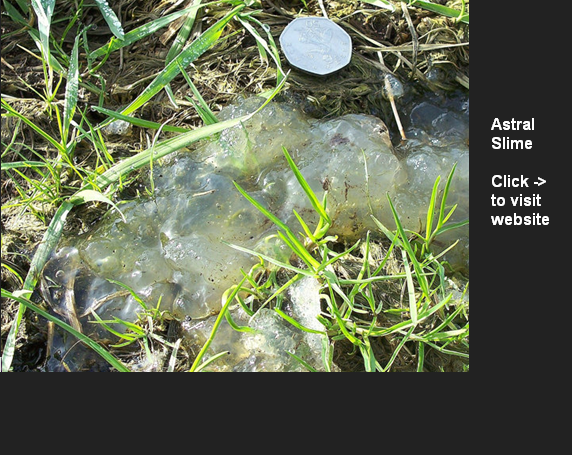 Some believe that the meteor that struck Russia last week could be responsible for this outbreak of astral jelly. What is Astral Jelly ? An intriguing possibility is that these jellies are a form of slime mould – a life-form that we are only just beginning to realise doesn’t fit well with current definitions of life on Earth. These moulds spread as a dust, until they combine with water to form jelly-like blobs. In fact, slime molds are believed to have inspired the 1950s B-movie called the Blob. One theory is that these moulds could have been carried on the meteor and dispersed through the atmosphere on arrival – alien life forms which then settle on Earth and communicate with each other to re-group. E. lycoperdon (the fake puff-ball) is named “caca de luna” or “Moon’s excrement” by the locals in the state of Veracruz in Mexico. Studies into slime moulds reveal they have complex organisational characteristics and appear to exhibit communication and hunting ability. Look how the mould ‘appears’ to solve the problem of finding the food by the shortest possible path. This epiphenomena could have been used to help design the Tokyo city rail network. We are being invaded by slime, lets hope they are friendly as well as brainless.